To Age in Place means that you will be remaining in your own home for the later years of your life; not moving into a smaller home, assisted living, or a retirement community etc. 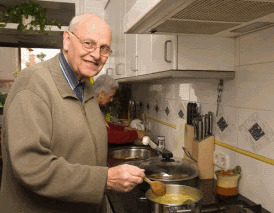 Of the many benefits of aging in place, the most important is that living independently at home is a safe and healthy option for seniors. Packed with people of all different physical abilities, nursing homes can be overcrowded, limiting the amount of attention and care that the staff can provide at any one time. Where is your home located? Are you in a rural or suburban area that requires a lot of driving? If you’re in an area with more public transit, is it safe and easily accessible? How much time does it take you to get to services such as shopping or medical appointments? Home accessibility and maintenance. Is your home easily modified? Does it have a lot of steps or a steep hill to access? Do you have a large yard that needs to be maintained? Support available. Do you have family and friends nearby? How involved are they? Are they able to provide you the support you need? Many older adults prefer to rely on family to provide help, but as your needs increase, they might not be able to fill in all of the gaps. It’s important to consider proximity to community services and activities as well. Isolation. If it becomes difficult or impossible for you to leave home without help, isolation can rapidly set in. You may not be able to participate in hobbies you once loved, stay involved in community service that kept you motivated, or visit with friends and family. Losing these connections and support is a recipe for depression. Medical conditions. No one can predict the future. However, if you or a loved one has a chronic medical condition that is expected to worsen over time, it’s especially important to think about how you will handle health and mobility problems. What are common complications of your condition, and how will you handle them? Finances. Making a budget with anticipated expenses can help you weigh the pros and cons of your situation. Alternate arrangements like assisted living can be expensive, but extensive in-home help can rapidly become expensive as well, especially at higher levels of care and live-in or 24-hour coverage. You may be used to handling everything yourself, dividing up duties with your spouse, or relying on family members for help. But as circumstances change, it’s good to be aware of all the home care and community support services available in your city that might be of help as well. What you may need can often depend on how much family support you have, your over-all general health, and your financial situation. Keeping a household running smoothly takes a lot of work. If you’re finding it hard to keep up, you can look into laundry, shopping, gardening, housekeeping, and handyman services. If you’re having trouble staying on top of bills and appointments, financial and healthcare management may also be helpful. Transportation is a key issue for older adults. Maybe you’re finding it hard to drive or don’t like to drive at night. Investigating transportation options can help you keep your independence and maintain your social network. You may want to look into local transportation such as buses, reduced fare taxis, and senior transportation options to appointments. Help with activities of daily living, such as dressing, bathing, feeding, or meal preparation, is called personal care or custodial care. You can hire help with personal care, ranging from a few hours a day to live-in care. People who provide this level of care include personal care aides, home care aides, and home health aides. Home health aides might also provide limited assistance with things such as taking blood pressure or offering medication reminders. Some health care services can be provided at home by trained professionals, such as occupational therapists, social workers, or home health nurses. Check with your insurance or health service to see what kind of coverage is available, although you may have to cover some cost out of pocket. Hospice care can also be provided at home. Day programs, also called senior daycare, can help you keep busy with activities and socialization during the day, while providing a break for caregivers. Some day programs are primarily social, while others provide limited health services or specialize in disorders such as early stage Alzheimer’s. Aging in place specialists are people who consult with construction companies and homeowners in remodeling homes for the needs of older adults. Some contractor's work with people certified in aging in place design and remodeling; AARP, the National Association of Home Builders and Home Innovation Research Labs offer a Certified Aging in Place Specialist credential for experts in the field. If you are considering making adjustments to your home, ask your construction company if they work with a certified aging-in-place specialist. For some seniors and the elderly technology is crucial in helping them Age in Place at home. Living under one’s own rules is a key reason for staying in one’s own home, with 42 percent of seniors choosing it as one of their top three considerations.